Weather always has a dramatic effect on wood. Especially when it comes to decks. My parents deck is slowly falling prey to the negative effects of being exposed to the elements. In this particular case, the railing is slowly pulling away from the side panels. That's one of the issues, the other is the deck is slowly sinking too, but I'm not equipped to fix that, so I'll stick with something a bit simpler instead. I broke out some basic tools (for some reason I couldn't find my pry-bar, which was irritating...), and got to work pulling up the railing. A number of the nails were quite stubborn, I was being attacked by wasps, and there may have been some cursing as well. Below, you can see the slow progress - pulling the railing up, bit by bit. The railing wood was in surprisingly good shape, oddly enough, but was twisted and some parts were starting to rot a little. Also, I'd rather use deck screws instead of nails for the railing. I'm not too sure if this is the best idea, but you learn by doing, so this is a bit of an experiment in a way. Once all the rails were pulled off, I drew a quick schematic, and threw some measurements down on paper. It would have been a bit easier to have done that first, but it didn't matter in the end really. Simple, I only need to buy 5 planks, and cut them to size. I'm likely going to go with pressure treated wood, but I need to look into which type of decking wood is best, since I do need to cut it, and I don't want to have to seal the wood, or the cut ends... so I need to find this out before spending a dime. It's time for the final instalment of the Patio Gate Rebuild project! When we left off in the last article, I had the gate glued up, the dowels in place, and gave the whole project a light sanding with 80 grit sandpaper. Sanding is my second least favorite task, and now we're moving on to the least favorite - paint/stain. I went over the whole project with some mineral spirits to get the sawdust out of the grain. Whether or not mineral spirits is appropriate for that, I don't know. All I know is I wasn't about to run out and buy tack cloth (I've had bad experiences with it in the past as well) so this method would do me just fine. After a few passes with clean rags, it was free of most dust. Now I had spotted some of those plastic yellow pyramid-shaped standoffs for painting on a previous Home Depot trip, and had the foresight to grab a set. I had a pine board still in it's plastic for a future build, so that would make a good base to apply the urethane over. I set up the pyramid standoffs, and got to stirring. I picked up a synthetic brush for this project, and made sure not to skimp. In the end I wish I bought those cheapy $1 brushes because really, synthetic brush + Spar Urethane = ruined brush, no matter how much you try to clean it. Oh, and never paint indoors, no matter how well you think your air circulation is. I got dizzy in a hurry. Which is strange, I figured it would have been fine. Regardless, the second and third coats were done outdoors. Once all three coats of urethane were applied (sanding with 180 grit between coats, and wiping off with a soft cloth, to keep it fairly smooth) - it was time to install the hinges. Since I had pre-drilled the holes for the hinges before finishing, this was easy. My parents deck is not level. Or square. It's actually a bit of a nightmare. So to get the gate to mount 'somewhat square' - or in this case I opted for level - I had to use a shim or spacer. Finally the fun part! I broke out the power tools, requisite bits, and all the clamps and shimming materials I'd need to get this gate installed. I ran into some issues with the baluster 'wedge' I had cut earlier... It didn't fit. Tossed aside and a new solution was planned, I remembered I had some cedar shims that would work well! So I clamped 1/4" worth of blocks on the left of the gate, clamped the gate to the railing, and shimmed up the right side to fit. Marked the location of the shims/hinges, and took it all down. After propping the gate up in the open position, I started to mark and drill the holes. Once those were done, I used deck screws to mount the gate to the railing. I chose deck screws because they were longer than the original hinge hardware screws included, and since I'd be using shims... they just had more holding power. After taking a moment to stare at my handywork, I moved on and installed the latch hardware. This required some delicate drilling of pilot holes and putting the screws in by hand. No brute force power tools here, I didn't want to split or crack the wood, and the screws are kind of close to the edges, which I don't quite like, but it seemed secure in the end. Now that the latch is installed, I had to drill out the receiving hole for the latch bolt, to keep the gate closed. Lucky for me, when the gate was closed, the latch sat in just the perfect place - everything was flush and no adjusting was needed. It fits Perfect! I plan to epoxy in a brass or copper pipe bit into the hole to give the whole thing more support, I just have to find a scrap bit in the junk bin. It should hold a bit better than wood, and to those who notice the little details, they'd appreciate it as well. After that was said and done, I had one last thing to add. I wanted to use one of those hook catches to hold the gate open (even though gravity already does that, a breeze might slam it shut) - so I threaded in the eyelets under the railing, and also threaded an eyelet in the closed position too, just for overkill. Now the gate can be secured with two latches. And voila! My "Patio Gate Rebuild" is finally finished, and just in time too - my folks are returning from their trip from Europe today. I hope they like it, I had a lot of fun building it, and now I can rest easy knowing my nephews + niece will be safe on the patio as well. I hope you enjoyed this project, feel free to comment if you have any questions or nice things to say. This particular project isn't really a "project" per se, and technically I didn't "make" anything for this either. But that isn't the point. It isn't always about creating something, more often than not, it's about improving things you already have. In this case, the medicine cabinet in my parents bathroom needed some improving. Well, it didn't need it but I felt it could do with an improvement. The latches on the cabinet doors were from the 1970's. (As seen below on the right) They worked okay. Problem is, the spring steel catches didn't grip well, and some were even broken off. And then there was the catch pins. They were worn flat in places. So overall they were pretty much worn out. I picked up some replacement catches. I wanted them to look nice, but also provide a positive engagement, and hold the doors securely. A quick trip to my local improvement store, and I spotted these nice brass ones. The seemed very solid. They engaged well. And they looked good. Sold! I started by removing the old catches. That was a bit tricky since the screws that held it all in were painted over many times, and whoever installed them in the first place stripped most of the screw heads. Measure, measure, measure... I measured where the new catches would mount to the frame, and secured them in. Here's where I discovered that brass screws are basically the worst screws to exist. Made even worse are phillips brass screws. Okay, okay... 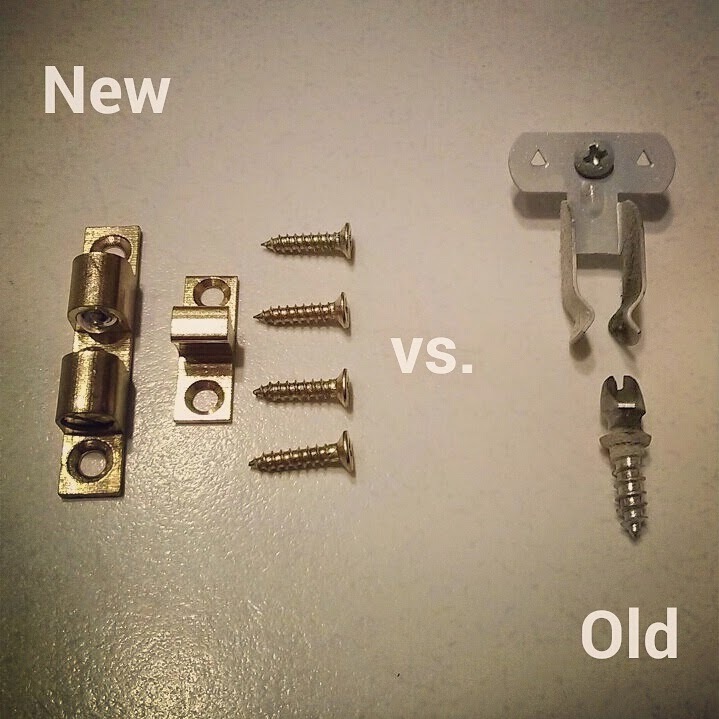 I don't really hate brass screws, it's just that if you're not careful, the heads will strip. Which is what I did to a few of them when installing. Next up was mounting the receiving catches on the doors. Measure and measure, and measure some more. These were a bit tricky since I couldn't seem to wrap my head around how to properly measure the correct position for them. But then I remembered an old trick. I put the catches in the latches, and coated the backsides with something that would transfer to the door when I closed it all up. I dug through the drawers and found lipstick. Haha, yep, that'll do. And it worked. And I was able to line up the catches and screw them on. Now for the catches, I opted to use a screwdriver and put them in by hand, instead of using a power drill. And that prevented the heads from stripping. Sweet. So with that, I closed all the doors up, and tested them one last time. They close properly, and better than the old catches. I'm happy, and I'm sure my folks appreciated it too. Welcome back to part 2 of my "Patio Gate Rebuild Project" - the construction phase. Now that the design phase is complete and the wood has been mocked up, it's time to start measuring and making cuts. Since this gate is constructed almost completely of cedar balusters, we start with those. I opted for 'roughly' 35.5" x 35.5", so first I cut the miters of the outside frame. Simple 8 cuts, measure and re-check to make sure the 45's were actually 45 degrees. Once most of the cuts were made, it was time to find out how long I had to cut the main vertical post... which turned out being the same length as the horizontal post, so I felt a bit dumb. But it gave me a good chance to mock up and check my cuts, see if I needed to trim anything, and also mark out where the half-lap joint would end up. Once the vertical post was cut to length and I double checked the correct position of the half-lap, I made my marks and began removing material. I used my "japanese saw" (thin-kerf pull saw) to make things a bit easier, and since it's cedar, it was like cutting through butter. Then I chiselled out the excess material for both the vertical and horizontal posts. I also learned that when you buy a chisel from a store, it doesn't come razor sharp... which makes a bit of a mess when attempting to chisel material out of soft wood. No big deal, since I would dowel the half-lap joint later. Once the half-lap was cut, it was time to cut some grooves for the panels I plan to install. This was a trial and error moment for me, since the table saw I was using was older than me and in bad shape, the fence needed to be constantly checked for square, and also I had to use the blade that was on it... no dado blades here. Once the grooves were cut, I mocked everything up again, checking the alignment of the grooves at the half-lap, and sliding in the panels to make sure everything worked out. After the grooves and panels were checked, I then assembled the whole thing to start estimating the spacing of the vertical posts, and also decide where the hinges should go, roughly. Everything seemed to fit well, the placement of the hinges would provide decent support, and the top hinge was placed specifically there to get more support from the horizontal brace. And then it was time to start some assembly. First off, I glued and screwed the half lap joint. I also pre-drilled pilot holes for everything, because I was scared the cedar would split. I know it's less likely for softwood, but I wasn't about to re-do a lot of work for something as simple as a pilot hole. This was also a great chance to start making things were square. The half-lap posts were basically the foundation of the whole gate assembly, so making sure things were square here, would pave the way for a fairly smooth and square finished product. Once the crossed balusters were set, I did another test fit, to make sure all the joints were flush, check for square, and make sure everything fit. I also set the spacing of the vertical balusters to make it look fairly even. This turned out to be a good idea, since I needed to adjust a lot. I had to trim off some excess material at the bottom of the vertical balusters... trim a bit from the horizontal cross-bar, trim the hardwood panels, sand the panel grooves to loosen them up a bit... basically finish up any last minute adjustments before I committed the whole thing to glue and screws. Once everything was adjusted, it was time to pre-drill the vertical balusters using the off-cut balusters as spacers. This made life easier in the end, because it let me screw in the balusters perfectly after. Without the pilot holes, it would have been a real headache. Now that I had everything pre-drilled and screwed in, I took a moment to step back and check the overall look of the piece. The spacing of the verticals looked good. The ratios of the whole thing seemed to fit well. I also took a moment to figure out how I would assemble the entire thing. Order of operations when it comes to assembly is critical. If you mess that up, it makes things difficult or impossible to assemble. And when you're using wood glue, there is no 'undo' button. The first glueing step was to unscrew the tops of the balusters, apply glue, and re-screw them - the deck screws acted as clamps, which made life easy. Since I was assembling in my living room, I put some wax paper down on my coffee table, to prevent glue drips. Onto the hardwood panels, once the main frame was assembled it made clamping these easy. Plus, to attach the rest, I'd have to assemble the top and sides, so having the base frame ready was required. Now that the panels were glued in, I glued the panel edges, installed and screwed on the top piece, and the side pieces, and miters. This proved a bit difficult, since if I hadn't pre-drilled the side frames and miters, I would have a tough time clamping the whole thing. So by planning ahead, once I got the glue on, I ran the screws into the miters, side frame, and top frame, to help clamp the whole thing. I tossed on a few extra clamps for good measure and to help align the frame and keep things square. As with any project where you don't have dedicated space, or other limitations, you tend to have to do it in stages. All of the above steps were spanned out over a couple days. Seeing as how the glue had dried, it was time to take a moment to make sure it fit between the deck railings. The deck itself is not square. Weather wreaks havoc on wood. Over time the deck is guaranteed to move, shift, settle, etc. On top of that, the city I live in isn't on bedrock. So foundations shift. Regardless, the gate is square, the deck is not. How do I fix it? I took some measurements, and drew out the space I need to fill on the side of a spare baluster. I will cut that on the table saw, and check the fit, to see if it sufficiently fills the gap and keeps the gate square and level. After going through one of the many test fittings, I wasn't entirely happy with the assembly of the gate. It was rigid, but the miter joints looked kind of ugly with a screw in them. Add to the fact that the glue joints weren't the strongest, and my original plan to dowel most of the assembly (which I skipped) - I ran out to the 'wood store' and grabbed some 5/8" dowel. Remove the miter screws, remove the side frame screws, remove the half-lap screw... drill out in steps (to avoid tearing up the soft wood)... and test fit the dowel in the holes. Cut the dowels down to their rough size, glue the pegs, install, and let dry. Trim off the dowel excess, and wham! You've got yourself some strong glue joints! The dowels look better than just plain screws, now if I didn't get tear-out when drilling out the dowel holes, I would have been thrilled with how it all turned out. With the assembly complete, it's time to sand down the whole gate, and get it ready for many coats of finish, and then the final installation of the hardware and the gate. In the spirit of making, it's not always about creating something new, but instead a lot of making is also improving things that already exist. The bathroom at my parents place is the source of improvement with this project. 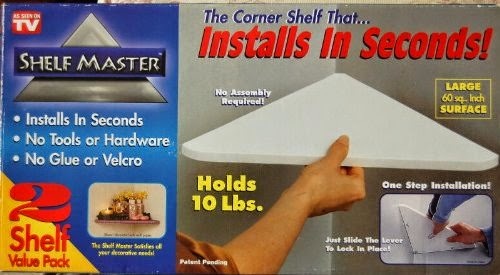 Years ago my mother had purchased the "Shelf Master" (some 'as seen on TV' crap) - made of cheap plastic, that had a sliding lock that caused little blades/pins to poke out and lock the shelf in place. The problem is this shelf is not very deep. It's also not very sturdy. The 'pins' barely held it to the wall, and you couldn't put much on it, without it tipping over. Also, most homes are not perfectly square. So the drywall is not a perfect 90 degree angle, causing the shelf to also not grab properly. My idea was simple. Just got some scrap wood, draw out a triangle, make it a bit bigger than the plastic one (to hold more stuff) - and also make it secure. It needed some brackets to attach to the bottom of the shelf, and also to the wall. I sized up the brackets, did a dry fit, and then secured them to the shelf. I also pre-drilled some pilot holes for the brackets, so I could run screws through to attach the whole thing to the wall. Making is not without it's occasional mistakes. When I was trimming the shelf to make it fit the contours of the wall, I was using a block plane. Well, planes and end-grain don't mix, and I ended up breaking a piece off. Oh well. It didn't affect the shelf, just looked a bit bad. I could have finished it with urethane or some sort of sealant... but I prefer the raw wood look. And it's not likely to get wet. Plus it was a quick hack made from scrap wood, so if it gets ruined, such is life. If I had to do it all again, I'd take more time with it, make it look nicer, and be more precise about things. But for a quickie project, I'm okay with how it turned out.